I’m Hsin-Ling (Sonya) Hung, Program Co-chair for the Needs Assessment (NA) TIG. Because of my involvement in the TIG, I have reviewed annual conference proposals since 2008. Over the years I found that some proposals only had a title associated with needs or needs assessment, but these are were not needs assessments. Since needs assessments are often misunderstood, here I share what I think are the key elements constituting a needs assessment. Using cooking as an metaphor, even a skilled chef would not be able to prepare a tasty dish without the necessary ingredients. So, if you are going to do a basic needs assessment, certain elements must be included. 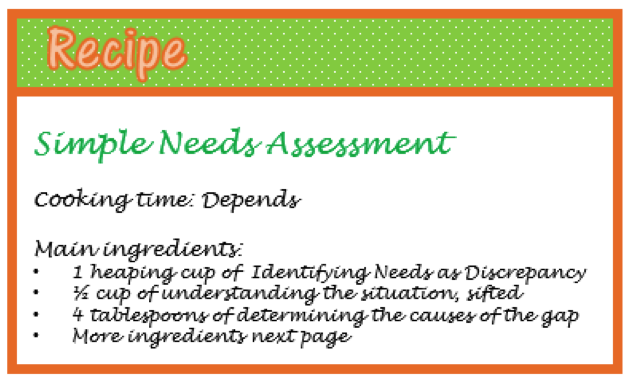 To create a simple ‘recipe’ for planning and reviewing needs assessments, I’m starting with Altschuld and Kumar’s definition of needs assessment. The fundamental of a needs assessment is to assess need (attend or resolve a problem) for improvement of organizations or systems. A need is the measurable discrepancy between two conditions—“what is” and “what should be.” Without assessing a ‘gap’ it is not a NA. A genuine needs assessment project would describe needs and the conditions associated with them. So how do we make this dish? After problems/issues have been depicted, you go through a process to understand the situation, the nature and the causes of the gap(s), prioritizing needs, making decisions about their resolution, and finally developing an action plan for improvement. All of these procedures would engage many constituencies and involve collecting much information. It might include organizing a needs assessment committee (NAC), examining root causes, prioritization, making needs-based decisions, and implementing action plan–all key parts of a simple needs assessment recipe. Detailed of all these can be found in the needs assessment kit edited by James W. Altschuld. Key Ingredients: Organizing a NAC; examining root causes; prioritizing; making needs-based decisions; and implementing an action improvement plan. Rad Resources: Check out the Needs Assessment Kit edited by James Altschuld.